If you are in the market for house siding for your Grand Island, Nebraska, home and want a siding solution that will require virtually no maintenance, then look no further than ABC Seamless. We are proud to offer siding that will never need painting or scraping, like wood shakes or cement fiberboard. Our product is made from 28-gauge steel, which is not only stronger than most other siding materials, but also resists seasonal expansion and contraction, which can cause seam separation in siding made from other materials, such as vinyl. Our siding is seamless – We will custom cut our siding to the length of your home to ensure a perfect fit. A wide array of aesthetic options – Our siding is available in nearly 30 colors and 15 different styles. Everlasting beauty – The special coating on our steel siding resists warping, fading, and chipping. Enduring protection – You will receive a lifetime warranty on our siding that covers rusting, peeling, cracking, and even hail damage. Another reason to choose ABC Seamless is that we work tirelessly to provide the best possible customer experience, and will ensure that you are completely satisfied with the job that we perform. This unwavering commitment to offering excellent service has helped us to earn and maintain a stellar A+ rating from the Better Business Bureau as well as a Top 500 rating from Qualified Remodeler. 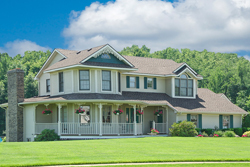 For more information about our house siding for Grand Island residents and to learn more about any of our other products, please contact ABC Seamless today. One of our courteous and knowledgeable customer service associates will gladly answer any questions you many have and provide a free, no-obligation quote. Additionally, we offer sunrooms, replacement windows, and much more for homeowners in Grand Island.